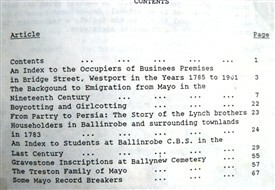 The Journal of the South Mayo Family Research Society was produced by the Family Research Centre here in Ballinrobe. 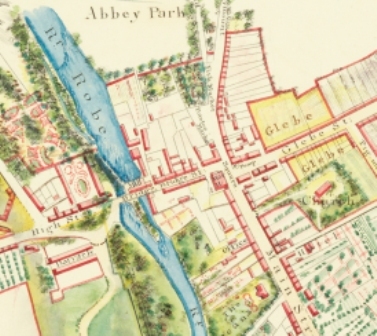 The office is on Main Street, Ballinrobe and its manager Mr. Gerard Delaney kindly gave us permission to scan and re-produce a selection of their articles to this site. 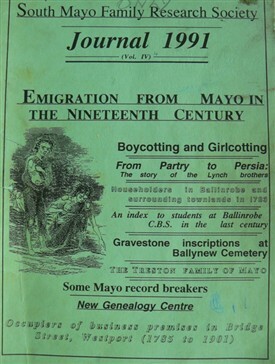 This first article, from the 1991 Journal gives some idea of the of emigration from Mayo in the 19th century to the United States, South America and throughout the British Empire. Among these were two Mayomen who signed the American Declaration of Independence, one who received a French title and another ..... just click on the PDFs below to see full pages of article. Supported by the local Tacu office and work experience member Ms. Zoya Kabir. This page was added by Averil Staunton on 24/01/2015.